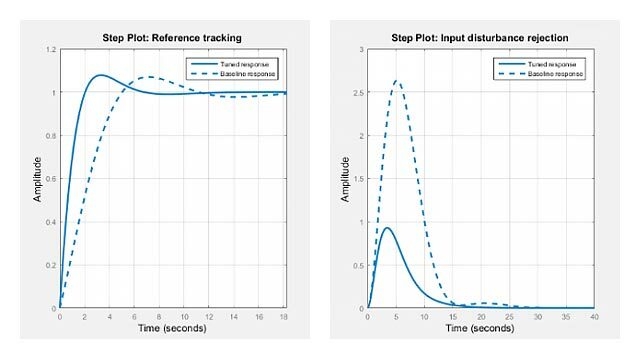 This example gives a tour of available time-domain requirements for control system tuning with systune or looptune. specifies a second-order, non-minimum-phase behavior. Use viewGoal to visualize the desired response. 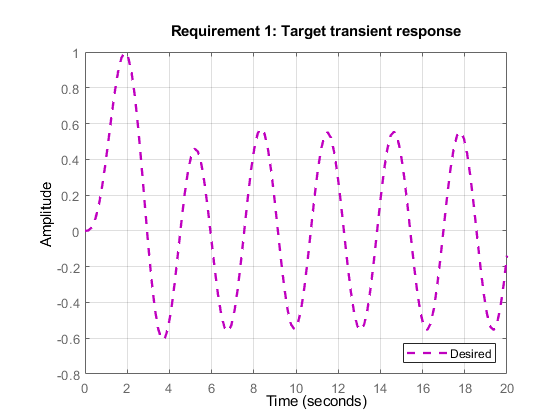 This requirement can be used to tune both SISO and MIMO step responses. In the MIMO case, the requirement ensures that each output tracks the corresponding input with minimum cross-couplings. limits the amplitude of to 0.3, the settling time to 2 time units, and the damping ratio to a minimum of 0.5. Use viewGoal to see the corresponding time response. You can also use a "reference model" to specify the desired response. 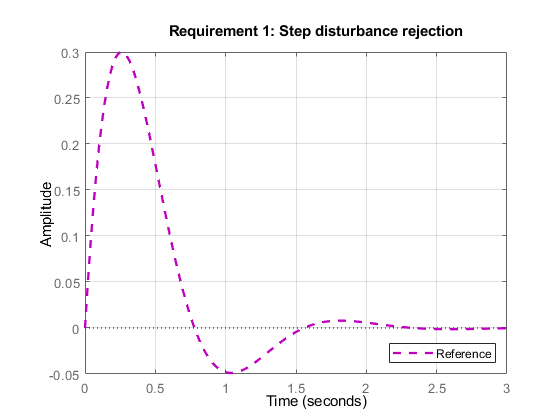 Note that the actual and specified responses may differ substantially when better disturbance rejection is possible. Use the TuningGoal.Transient requirement when a close match is desired. 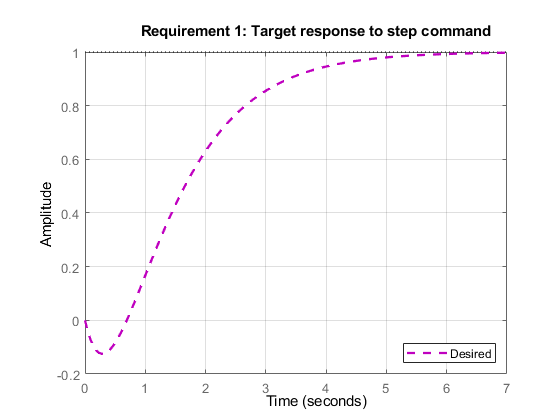 For best results, adjust the gain of the reference model so that the actual and specified responses have similar peak amplitudes (see TuningGoal.StepRejection documentation for details). 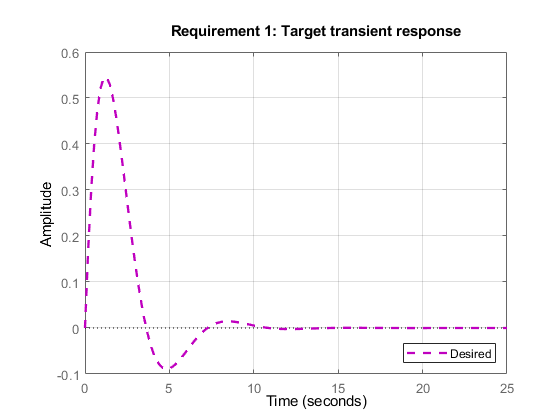 requires that the tuned response from to look like the impulse response of the reference model . The input signal can be an impulse, a step, a ramp, or a more general signal modeled as the impulse response of some input shaping filter. For example, a sine wave with frequency can be modeled as the impulse response of . Use the TuningGoal.LQG requirement to create a linear-quadratic-Gaussian objective for tuning the control system parameters. This objective is applicable to any control structure, not just the classical observer structure of LQG control. For example, consider the simple PID loop of Figure 2 where and are unit-variance disturbance and noise inputs, and and are lowpass and highpass filters that model the disturbance and noise spectral contents.